Camellias are easy to grow when planted in the right USDA Zone, the right exposure to sunlight, the right soil, and proper fertilization. A well-drained soil is a must. Camellias will not tolerate constantly soggy or wet soil. When planting camellias in less that fertile soil that is low in organic matter, it's good to mix an organic soil amendment, such as mushroom compost, composted manure, or your own homemade compost, at a 50/50 ratio with the soil removed from the planting hole. This will help to get your plants off to a good start by stimulating root growth. Newly planted camellias can also be watered with a solution of Root Stimulator. During the first spring, fertilize your camellias in late winter. Fertilize again, if needed, lightly in late summer, but no later than 60 days prior to the average first frost date in your area. Late feeding could encourage new growth that might be damaged by a freeze, which can compromise the overall health of your plants. Camellias prefer an acid soil so fertilize them with an Azalea, Camellia & Rhododendron fertilizer or a shrub and tree fertilizer that contains sulfur and/or iron. Avoid using fertilizers that contain much more than 10% nitrogen (the first number in fertilizer) and more than 20% phosphorous (the middle number). Refer to product label for application rates and instructions. Alternatively, you can feed your camellias with a natural or organic plant food. Some folks don't ever feed them with man-made fertilizers. They simply mulch plants in early spring with organic compost or rotted leaves. Note: If the leaves on your camellia turn pale green or yellowish this could be an indicator of iron deficiency, or soil that is too alkaline. Camellias grow best in an acid soil ranging from 4.5 to 6.5 on the pH scale. Most average garden soils fall between a pH range of 6.0 to 7.0. If you're unsure about the pH of your soil, and whether or not it's suitable for growing camellias, it's a good idea to test the pH in the planting area. You can quickly test soil pH with an inexpensive soil pH tester probe. To raise the pH (make more alkaline) you can add pelletized limestone to the soil. To lower the pH (make more acid) you can apply Soil Sulfur, Aluminum Sulfate, or Chelated Iron. Adding organic compost to the soil or using compost as mulch can also help to increase acidity and maintain acid soil conditions. See: What is Soil pH and How To Adjust It? NOTE: Yellowing or fading of leaves can also be an indicator of insect infestation from chlorophyll-sucking insects or from soil that is constantly wet or soggy. When foliage is discolored, first check the undersides of leaves for the presence of lace bugs, aphids or other insects. If you find damaging insects use an insecticide such as Malathion or Neem Oil to control them. Camellias do not like constantly soggy or wet soil, which can cause yellowing or browning of foliage. If the soil stays wet, you might need to reduce watering or, to ensure good drainage, you might need to lift the plants and replant them in a mound or to another area in the landscape. Camellias prefer a moist but well-drained soil when establishing themselves, however are quite drought tolerant when established. They do not like constantly soggy or wet soil conditions, which often leads to the onset of root rot and other harmful plant diseases. So be careful not to over water! Immediately after planting deep soak the soil in the planting area, including the rootball, to a depth equal to the height of the root ball. For an extra boost, to stimulate early root formation and stronger root development you can also water you newly planted camellias with a solution of Root Stimulator, which reduces transplant shock and promotes greener, more vigorous plants. When planted during the winter dormant season plants will require less water. So, be extra careful not to overwater during winter! In average garden soil you should not have to water your newly planted Camellias every day. More often than not, this causes soggy soil conditions that can lead to root rot and other plant diseases. In the absence of sufficient rainfall, water only as needed to keep the rootball and surrounding soil damp to moist. Keep in mind that deep soaking less frequently is much better than splashing just a little water on the plants every day. Plants planted during the winter dormant season, when plants are not actively growing and evaporation is much slower, will require much less water. So, be extra careful not to overwater during winter! 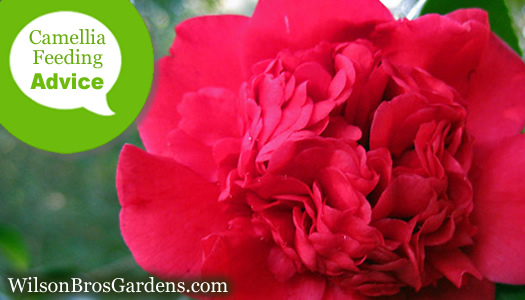 When established, camellias are moderately drought tolerant plants. Only during periods of dry weather will they require supplemental irrigation. Wilting new leaves or bending stem tips during a drought is an indicator that your plants could use a good deep soaking. Always check soil moisture before watering. Tip: When watering with an automated irrigation system it's best to set your timer to water during the early morning hours and not in the late evening or at night, which can lead to the onset of fungus and other foliar diseases. Check soil moisture within a few days after planting and adjust your irrigation system accordingly to provide only enough water to keep soil moist, but not soggy.